In case you haven’t noticed, cork flooring has undergone a quiet revolution in recent years, shedding its dreary 70s homespun image and emerging as a wholly interesting and infinitely greener alternative to traditional hardwood flooring – and the latest manufacturing and coloring techniques means that you can achieve cool and chic aesthetics to match any of the latest design trends. 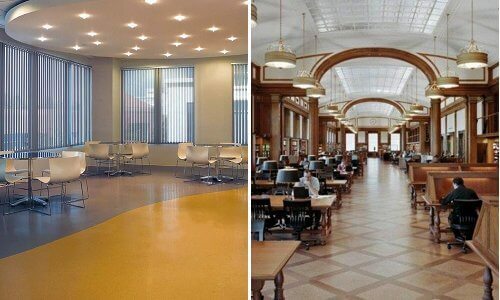 In fact, when researching this post, even I was surprised by the extraordinary advantages of cork flooring. For a start cork is a natural, harvested material making it a great environmentally friendly choice; it also has a long life span and is easily repaired, so there’s longevity and durability in-built. Whilst cork is softer (and more comfortable) than hardwood, its inherent elasticity means that it is less prone to dents and scratches, unlike hardwood; and it has excellent thermal and acoustic properties too. And if that’s not enough to convince you, then it’s good to know that cork contains a substance called suberin that repels bugs, mold and termites, making cork naturally anti-allergenic and insect repellent! And its also suberin that helps make cork both fire and water resistant – cork can be submerged under water for yonks without rotting, one of the principal reasons it’s used for wine bottle stops! The cost of cork is also reasonable, although not exactly cheap, with average prices of around $5 per sq/ft; click here for more on cork flooring prices. Finally, cork is definitely one of the easiest flooring options to install – usually coming in pre-glued adhesive tiles that are simplicity itself to stick down, even for a DIY novice. 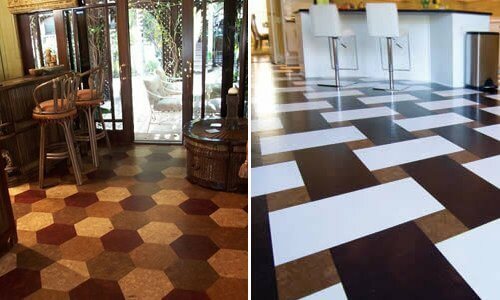 So, now that you’re convinced, let’s review some of the best cork flooring brands available on the market. Wicanders – Amorim Revestimentos, the group behind the Wicanders brand, are quite clearly the global market leaders in cork flooring, with a presence in over 55 countries around the world. This global superiority, plus the fact that the Wicanders brand has been in the business of producing flooring since as far back as 1868, is most beautifully demonstrated in the utterly covetable cork flooring they offer. Wicanders’ four cork floor collections offer multilayered engineered flooring combined with cork, wood, or digital photographic veneers to give a huge range of floors that covers traditional hardwood, natural stone and classic cork aesthetics. This means that you can get the comfort, durability and green bonus points of cork with whatever look you want, be it the elegant linear natural cork pattern of Corkcomfort Reed Meridien (below right), the distinctive tawny grain of Artcomfort Prime Rustic Oak (below left) or the cool deep gray of the Vinylcomfort Coal Slate. If it sounds like I’m a bit infatuated with Wicanders, well it’s because I am – I just can’t get over the breadth of flooring looks they’ve achieved using cork! If you’re still not convinced about cork, have a look at the fantastic images on the Wicanders’ website: I’d be surprised if you too weren’t converted on the spot! Globus Cork – Globus bill themselves as the “premier manufacturer of cork floors… [who] pioneered the development of colored cork flooring, matching beauty and function in a sustainable flooring choice”, and it is true that they have an absolutely exemplary record both in terms of product choice and green credentials. Since 2007 Globus have been using “only renewable wind energy for our manufacturing energy needs” and their manufacturing process involves non-toxic water-based colors, adhesives and finishes. Their range is huge: three different textures of tiles come in over 30 colors, more than 20 sizes and any square geometrical shape you can think of! Easily customizable for those with design flair (their website provides no less than 27 pattern ideas for those that don’t), pretty much any design that you’ve seen in ceramic tiles can also be achieved with Globus cork tiles. Plus they have both glue down tiles and floating floor options (note that floating floors are not 100% cork, but fiberboard/cork combination), both of which have been designed to effectively deal with the environmental expansion and contraction that occurs with all natural products. Capri Cork – A relative newcomer, Capri Cork established in 2006, aims to offer a “fresh approach” to flooring products with its high quality cork and recycled rubber flooring ranges. Cutting-edge green technology works at its best here, particularly with the very interesting AND/ OR rubber cork range – a hybrid floor tile made by combining recycled rubber granules and cork dust, resulting in some unexpectedly fantastically bright colors and textures. And even Capri’s standard 100% cork range Mediterra Cork, with its earthy tones, is unusual in the variety of pattern and texture available. For instance you have the Mediterra Rigato collection which is made with strips of different toned cork; and also worth noting is their offering of the Mediterra ranges in plank format which allows you to create lovely parquet style patterns in cork. Capri Cork has also recently introduced a new Eco-Clicks range constructed in laminated layers and with a tongue and groove system for floating floors. The range currently comes in sixteen color combinations including one called Channel White – a very covetable bleached white cork floor. USFloors – USFloors pride themselves in specializing in “unique and sustainable’ flooring and have a number of interesting products including cork, bamboo and natural oil finished hardwoods. They have impeccable green credentials: not only do they ensure that their cork is sourced from trusted renewable sources, they also work hard to reduce their environmental and energy footprint at their factory in Georgia in various ways, including using solar power, having energy efficient lighting and even installing low flow toilets for their staff! USFloors currently have five cork flooring ranges – all in generally earthy tones (except for the Custom Almada Pacifico which is a startling gorgeous deep ocean turquoise) – including a glue down cork parquet range, both wide tile and narrow plank ranges and the excellent customizable Almada range. The US Floors website is very comprehensive with detailed information about specifications and installation, and all of US Floors cork flooring are finished with their excellent proprietary Endura AR UV-cured finish. 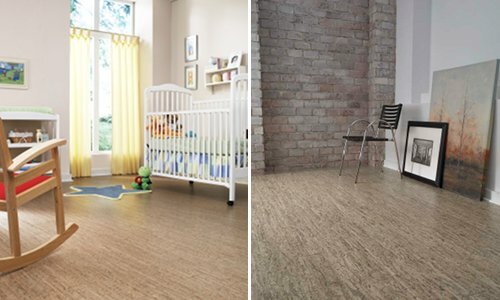 The US Floors cork range is widely available at various retailers across the USA, including Lowe’s. 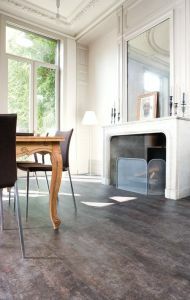 Click here for our reviews of USFloors luxury vinyl COREtec flooring range. WE Cork – WE Cork boast 5 generations in the business, so you’ve got to believe that they know a thing or two about cork! It’s clear that they do love cork, with a surprisingly diverse range of products, including flooring options, building materials such as cork underlay and insulation, but also fashion and home accessories such as cork made baskets and bags! Their flooring comes in two types. First there’s the Classic Collection, a small but perfectly formed 100% cork range with just four colorways available in both tile and plank formats that can be finished either with wax or varnish. Second there’s the more extensive Floating Floors range comprising four collections of engineered cork and high-density fiberboard layered planks and tiles. The Avant Garde, Timeless and Eco-Nomical Collections all offer what most would call “classic” cork aesthetics in various colors; but the Serenity Collection is particularly interesting because WE Cork have used high definition digital print technology to reproduce hardwood or stone tile aesthetics on a cork substrate, meaning that you get the look of hardwood or stone but with the comfort of cork – neat! Expanko – This company, part of the Stonhard group, specializes in high quality commercial cork, rubber and cork/rubber mix flooring; they also have a small collection called Vallarex which is a floating cork floor more suited to residential installations and available in six colorways/ looks including the rather beautiful and chic Algarve plank that has an integral rectangular mosaic aesthetic to it. Among their many high-end commercial customers are the Pennsylvania Historical Society, the US Chamber of Commerce in Washington, Harvard Baker Law Library and Houston Ballet, so you’re in very good company, and clearly in very reliable hands with Expanko. With their Heirloom range, Expanko are unique in offering a 1/2″ (12mm) thick, Class 1 Fire Rated, solid cork floor tile that has excellent performance qualities ideal for commercial installations; and the XCR4 blended recycled rubber and cork flooring is available in a large range of colors and formats so that your floor can be customized entirely to specification. APC Cork – APC Cork work in conjunction with a specialist Portuguese company called Granorte which was established in 1972 with the express purpose of recycling cork waste from the wine stopper industry. Today, Granorte is one of Portugal’s leading manufacturers of cork flooring, with a focus on creativity and innovation that results in some truly beautiful products. APC Cork carries the full range of Granorte floor that includes five floating cork floor collections and one collection of glue-down cork tiles. One of the selling points at APC Cork is the real breadth of styles and colors available, including marbled/ variegated, mosaic linear and cubed or densely packed natural cork looks. In particular, I like the Gem Collection which has five colorways including the sage green toned Jade and the periwinkle blue toned Spectrolite – great choices for kids bedrooms; and in the glue-down tile collection there is also a great variety of interesting textures and colors, from the swirly terracotta Mirage to the variegated gray/ cream Sky tile. Home Legend (available at the Home Depot) – Home Legend is one of four brands of engineered cork flooring available at the Home Depot, and to our mind the one that offers the most interesting range of choice. Attractively priced at between $3 -$3.60 per square feet, the range features attractive patterns and textures that will suit most interior design schemes. What caught our eye however, particularly because we haven’t seen them anywhere else, are the two Home Legend “parquet” patterned cork tiles – Herringbone (shown below left) and Basket Weave – where the cork fibers have been arranged and compressed into these classic linear parquet style patterns. 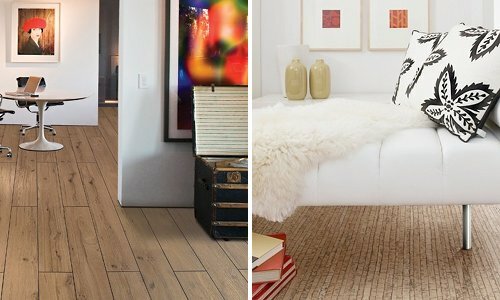 Have you installed any of these cork flooring brands in your home? If so we’d love to hear your personal review of these products, just drop us a line in the comments section below. I am seriously considering using a cork product in most of my home and was almost ready to purchase 1500 sq. ft. of Twilight with a company called Cali Bamboo who claim other products don’t compare to theirs yet I do not see them on this list of recommended cork brands. Part of what they touting as exceptional is that they have 4 times the durability factor in their product. Anyone ever heard of this company or product? Yes, we know Cali well, they are mainly known for their bamboo flooring. I don’t have first hand experience of their cork flooring, but they are certainly a reputable and trustworthy retailer. No problem at all. I hope it all works out great! Thank you Gary, yes we absolutely have heard of Torlys and a review of their cork flooring will be coming very soon. They certainly are a respected brand. Would love to hear about your experience with Cali Bamboo. I would also love to see pics of your new floor. How was the experience? Any experience with the brand, “Lisbon”? Lumber Liquidators carries their products. Thanks for your advice. Thanks for the question Debra…I must admit I don’t have experience with that particular product…I did find this post from a remodeling forum which might help? Thinking of buying icork floating floor. Brand is also called Forna. Hi Jon. Please let us know how you get on. After reading tons of stuff about cork I chose it to use on my upstairs bedroom. I have 4 cats and 2 medium/small dogs. One of my dogs is about a year old , she gets very excited and is a pee-er =o) I just installed Comfort Cork massive plank and she promptly urinated on it. The edges around the plank started bubbling up. I’m so aggravated! The company I purchased it from told be I had to add an ADDITIONAL sealer to fill in the seams. Is other cork like this? whats the best /easiest thing to use? We have a fairly dry basement (in a townhouse) and are considering using the Wicanders Cork Vinyl product in our basement. Our basement floor is concrete but will be putting in a subfloor. How does cork hold up in that type of environment? Any feedback or recommendations would be helpful. I checked with our friends over at FlooringMyLife.Com, who sell Wicanders cork, and as I thought cork would be a great choice for your situation but don’t forget to put down a moisture barrier. Hi! I would love to not spend an arm an a leg, but definitely want quality. Not sure whether to go with Amorim from Menards or Lisbon from Lumber Liquidators? And should I pay extra (around $5+) for additional protective coatings, or is it just as ok to buy around $3.50 sq ft and add my own sealant? I just don’t want to mess up! And if I get wicander’s original, does that have enough sealant or do I need to reseal? I am trying to find a suitable cork sheeting material for replacing the current 40 yr old cork sheeting (36″ x 24″ x 4mm) as interior main cabin flooring in my Tartan-34C sailboat. It has held up extremely well for 40 yrs but has suffered, physically, during the past 3-4 yrs. It is ‘glued’ down and the adhesive is what degraded allowing the physical damage to occur. This and any future flooring can NOT be coated as it would be slippery if wet. Would a cork underlayment be suitable material? The sheet dimensions are important due to the shape/dimension irregularity of the floor. Hi Peter, a cork underlayment sounds like it might do the job but your question/situation is so specific that I really feel you would be better off asking this to an sailing expert…in truth I don’t know if you need a specialized product or not. Hi Peter! 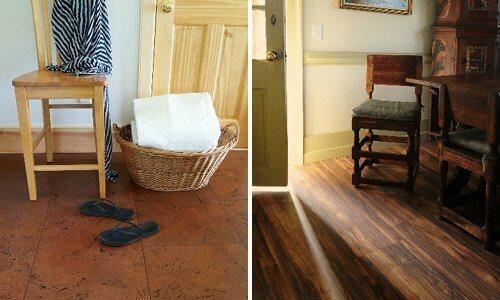 I’m considering using cork flooring in my mudroom. After everything I’ve been reading, it seems the “glue” version may be better than the “floating” option? Have I mentioned I live in New England, so this floor will have lots of snow covered boots walking on top? Would love your opinion. I am so appreciative of all these questions and answers. I am looking for a way to floor a condo in Tulsa OK. At 720 square feet, I only have $2000 to spend and some great free help. I am hoping a $2.00 a square foot product from Cali Bamboo will solve my problem. Does anyone have a better suggestion? Thank you very much! Hey all, Cork has been on my radar for 14 years now, I want to have it in the kitchen as many pro kitchens have cork flooring. But the kitchen reno is way off for various reasons. Since I am renovating my studio and workshop space downstairs/below grade, I started looking into cork there. Four years ago I did not find a lot, but it appears that things have changed tremendously and there is a lot of cork flooring out there. The problem that I have and that is not mentioned anywhere here is that it is so hard to know which manufacturer makes a green product. I looked into icorkflooring and love their bleached birch, but find the icorkfloor selling cancork, which is forna … a bit strange. Their eco certificate of testing in German (I am German, so I had no issue reading it) listed some Chinese company. So I don’t find that as trust worthy. WE and Wicanders are great, but the really awesome looking ones are too expensive for my 600 square feet (I am in the midst of starting a business, so I am doing this by going in debt). Cali Bamboo is mentioned here in a few posts, but I read a lot of negative reviews regarding them. Did anybody install their floor? Lumber Liquidators was mentioned here as well and I read that their cork is chock full of formaldehyde as binder, something I definitely want to avoid. So how does one go about finding out exactly how green/low emissions a floor is? Outside of the company just claiming that it is. Also – I find conflicting advice on adding additional 3mm cork underlayment under a floating floor – over the plastic sheeting – some say absolutely and some say absolutely not. So – what are people’s experiences here? I have these same questions as well. There seems to be very little research out there comparing companies and brands or it’s sure hard to find. I’m looking for this info as well. What’s the best manufacturer? 1) I’ll lay the cork (floating) over ceramic tile in the entryway, and over plywood subfloors in the living and bedrooms. I know that cork is a sound-insulator, but do you suggest an additional sub-layer to further sound-proof my place? 2) Over the ceramic and plywood subfloors, will I also need a moisture barrier? And, is it possible to lay both a moisture barrier AND a sound barrier under the cork? 3) The brand I found at Lumber Liquidators is called, “Barcelos.” Have you heard of it? Is it a quality brand? Hi Anne, thanks for the questions…are you planing to install this flooring yourself? Hi Anne. I live on the top floor of a Condo, built in 2002. The place is hollow….and my floor plan is identical to the unit below. Over the years, the sound has increased from TVs mounted on the walls in every bedroom, loud bass music from the teens to a Movie Theatre surround system that forces me out of my home. I understand your “wish”, believe me! I have been researching for several years and if I could afford it I would: Start with Green Glue, followed by MLV (Mass Load Vinyl) and finished off with Cork Floors throughout. It might seem excessive, but depending on your situation and what is causing the noise (airborne or impact or both), the higher the STC the better. Good luck and I hope your cork flooring brings some quiet beauty into your home. We will be remodeling an existing half-bath to add a shower and wonder about using cork flooring in this room. We’ll be having a contractor do all of the work. Thanks! Were you planning to use the soft cork tiles typically used in bathrooms or engineered cork flooring? we have a basement level condo (cement floors with laminate wood surface currently) and want to have cork installed. From what I’ve read, it looks like floating floor with moisture barrier is the way to go. I am looking at Harris Cork, but don’t see it in your review. Any thoughts? I am looking at Harris Cork too for my yoga studio. Would love thoughts on the brand before making big investment!! That is exactly why I am researching cork. Yoga studio floor – how did it work for you? This is a great source of information. Thank you all. 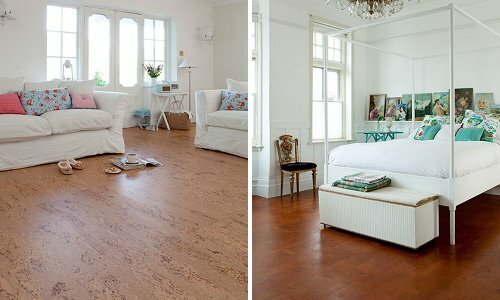 I am looking for a floating cork flooring for a 300 sf yoga room. I read some reviews on Seville, made by Wicanders, that were not favorable. Does anyone have any customer service reviews with any company that are recent? My head is spinning with specs for floating cork flooring products. Ten years ago I installed 660 sq ft of Wincanders 100 WRT Originals Harmony in our lower level living area (below grade). I loved the color, look, warmth, and could stand for hours with out my legs hurting. We had an issue with the finish appearing dull after installation. The installer came back out, screened it, and applied a Bona finish to it which made a difference. We recently had a plumbing issue that required removing the entire floor. I have woodwork and doors that were finished with stain custom-matched to the flooring that I do not want to change. So, I am looking at the the same color/pattern to what I had before, only from a variety of manufacturers. This is where I need your help. We are considering Wicanders again, along with US Floors and APC Cork. The installer/salesman we are talking to “demonstrated” (by tearing off edges) how much softer/cardboard-like the Wicanders core was compared to the other mfgs, however, they are all listed as HDF in their specs. APC has JointSheild that is supposed to give added protection to seams; the others do not. I am not impressed with the sheen of the APC sample. All of them can be recoated and in some cases, and extra coating is recommended to “seal” seams. The Wicanders is almost double the cost of the others, but if it is the better product overall, I am okay with that. be careful of any distributors claims. They have been caught lying, Lumber Liquidators for example. Get manufacturers information,not from there re-seller. There sure is a lot of great information here. I am struggling between the Wicander and the Forna. The Forna is almost 2 mm thicker, and less expensive. But, I am not finding much information on it. We want it to be as “green” as possible, and very durable. Hoping maybe someone has made that comparison already. Thanks. We installed APC cork in our basement and love it! In the process of construction, we had a water leak that ended up all over the newly installed floor and it cleaned up so well. There was no bubbling or pealing at all. It does scratch easy (we have a large dog) but it touches up easy with a stain marker. Also it doesn’t get cold on top of concrete. I am so happy with it that we just had it put in the living room. Pricing for printed cork looks to be some of the best. Also Forna cork has a few distributors in Canada that are cheap. Does any one have recommendations for un-finished flooring grade cork suppliers. I’ll be doing a custom job using 20″x30″ glue down tiles on concrete slabs in residential high rises. The finishing will be done after the installation. I would consider using an overseas supplier in Portugal or otherwise. Has anyone used NuCore flooring “water resistant”? what about heating under cork floors on concrete?? We installed APC cork 2 months ago and it still is off gassing and still smells very pungent even after continued ventilation. Anyone else have this problem? Is it the finish or the HDF or both? Looks great but we cannot stand the smell! I just finished watching a webinar called ‘Toxic Home’. If products are ‘off-gassing’ that indicates the use of chemicals which is very unhealthy. We have a IPOCORK cork floor in the kitchen which is a high traffic area. It is 15 years old and although apparently warrantied for 25 years, it needs to be replaced. We did not know that the finish should be redone with poly-urethane regularly and it has scraped and gouges. We did have a Bishon dog (11lbs) and 2 boys (and their friends) and were informed that cork flooring could handle that. However, the floor is a great option for a kitchen as we spend so much time in this room. It is warm, really easy on the back when standing for a long time and we love the look of it. So, we would like to replace it. I did contact the distributor for IPOCORK but have had no response from them regarding warranty so we will not be using IPOCORK again. We have tried to find longevity comparisons regarding different brands but have no clear understanding of that through the information available. Could someone advise us regarding “hardiness” scale of the various brands or alternatively, what brands are used for commercial floors or high traffic areas? Thanks. Is the home legend brand formaldehyde free? 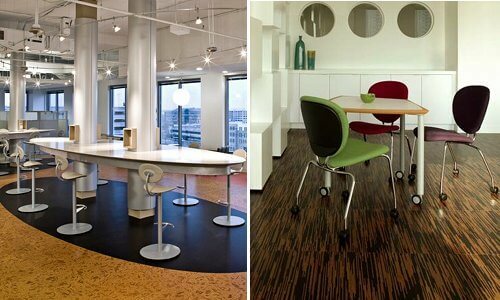 I would like to know if there is a commercial floating cork floor for a heavy traffic, such as for a coffee shop. My hubby has a man-cave (2nd floor, bedroom) where he plays his music (sound system). Currently there is carpet installed but it is stained and worn. I suggested replacing it with cork since it has good acoustic properties. I definitely want a ‘green’ product, no formaldehyde, chemicals, etc. We live in Surrey, BC Canada. Can anyone suggest a good supplier and cork product? Thanks very much for your input. Hi. 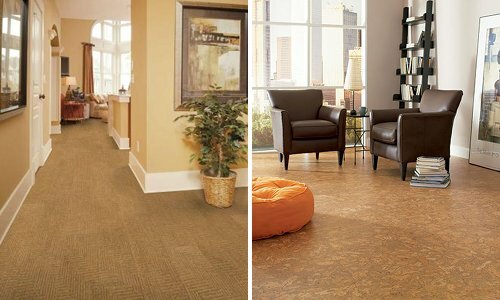 Does anyone have experience or knowledge about NuCore or Eco Forest brands of cork flooring?